The floss pack used to stitch original model of GP-248 Boughs Ala Round. Also includes 1 skein of Sullivans Floss for attaching beads. 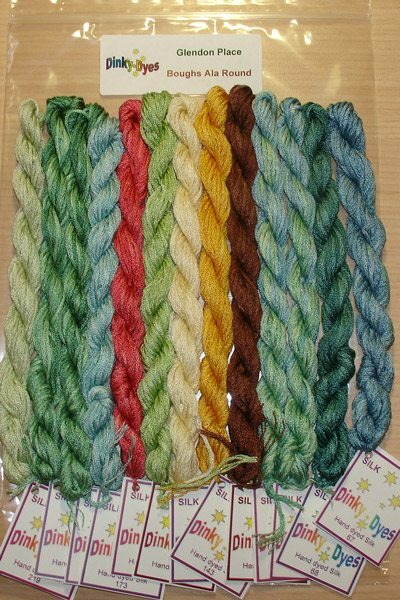 The Boughs Ala Round Silk Floss Pack includes 11 colors (13 skeins) of Dinky Dyes 6-stranded Silk Floss (a skein contains 8 meters, which is approximately 8-3/4 yards), of the following colors and 1 color of Sullivans floss for attaching beads. The embellishment pack, containing the Mill Hill Beads is sold separately.